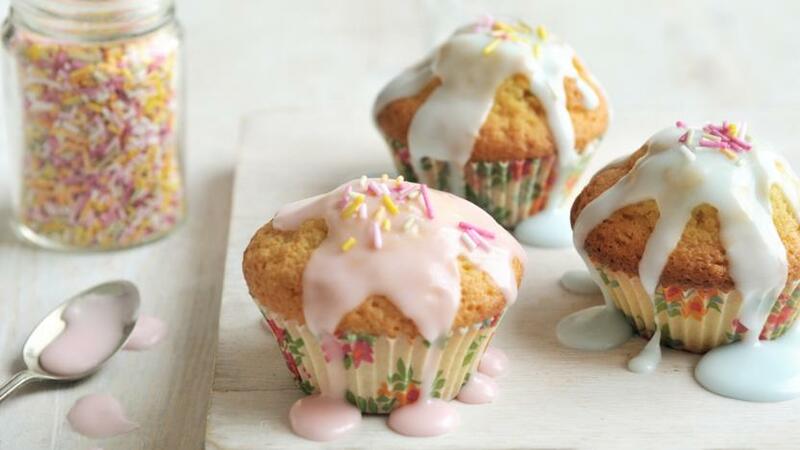 This easy peasy fairy cakes recipe is perfect for baking with children. Decorate with a little drizzly icing and plenty of sprinkles, or go for the full butterfly effect. Preheat the oven to 180C/350F/Gas 4 and line 2 x 12-hole fairy cake tins with paper cases. Cream the butter and sugar together in a bowl until pale. Beat in the eggs, a little at a time, and stir in the vanilla extract. Fold in the flour using a large metal spoon. Add a little milk until the mixture is a soft dropping consistency and spoon the mixture into the paper cases until they are half full. Bake in the oven for 8-10 minutes, or until golden-brown on top and a skewer inserted into one of the cakes comes out clean. Set aside to cool for 10 minutes, then remove from the tin and cool on a wire rack.